While accelerometers are the current leaders in commercially successful MEMS technology, other inertial devices such as rate gyroscopes are poised for a similar success. In addition to high-volume markets for automotive crash sensors, there are niche markets for high-resolution seismic sensing and high-g sensors. This article presents an overview of the designs and operating principles of some MEMS inertial devices. Accelerometers are the stars of the MEMS show , with millions bought each year by the automotive industry. Devices with integral electronics offer readout electronics and self-test capability, and cost far less than accelerometers of decades ago. The physical mechanisms underlying MEMS accelerometers include capacitive, piezoresistive, electromagnetic, piezoelectric, ferroelectric, optical, and tunneling. The most successful types are based on capacitive transduction; the reasons are the simplicity of the sensor element itself, no requirement for exotic materials, low power consumption, and good stability over temperature. Although many capacitive transducers have a nonlinear capacitance vs. displacement characteristic, feedback is commonly used to convert the signal to a linear output. The output can be analog, digital, ratiometric to the supply voltage, or any of various types of pulse modulation. Sensors with digital output are convenient when the data must be transmitted without further noise degradation. In general, the displacement of a sensing element is an essential part of the sensing process, and dg is part of the open-loop gain of the sensor, so there tends to be a strong inverse relationship between sensitivity and bandwidth for any class of sensors. From Equation 4 we see that a large mass and a high Q (low damping) help achieve a low noise floor. 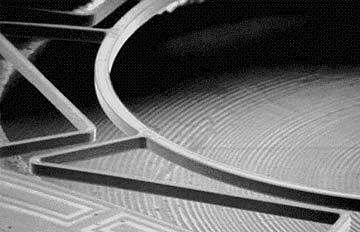 To achieve a large mass in a micromachined sensor typically requires a wafer-thick proof mass carved out of the sensor chip. For absolute minimum noise, the damping constant must be reduced by suspending the proof mass in a vacuum from purely elastic springs. Feedback prevents the sensor from ringing at its resonant frequency. Figure 1. 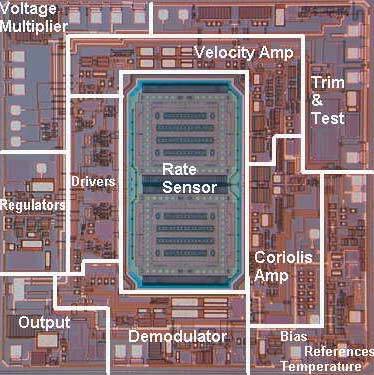 In the Analog Devices ADXL 50 accelerometer, the electronics occupy the majority of the 3 mm 2 chip area. The 2-axis device is not only extremely small, but also modest in power requirements and can measure both static and dynamic acceleration. proof mass elements. The 2-micron-thick polysilicon layer is deposited on a sacrificial layer of SiO2 that is removed in a final release step with hydrofluoric acid. One advantage of this technique is that it can be combined with a CMOS or BiMOS process, allowing the entire system (electronics plus sensor) to be inexpensively integrated on one chip. The ADXL202E (see Figure 1), a low-cost, low-power (2 µA per axis), 2-axis accelerometer with a range of ±2 g, can measure both dynamic (vibration) and static acceleration (gravity). The outputs are duty cycle modulated signals, with duty cycles proportional to the acceleration in each of the two sensitive axes. 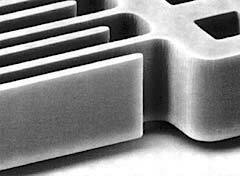 The surface micromachining process developed at U.C. Berkeley in the early 1980s was at the time restricted to about two microns of structural polysilicon. In response to the stress and stress gradients that limited the size and flatness of these MEMS structures, alternative fabrication techniques were developed that yielded higher precision devices. They included thick polysilicon processes (epi-poly  and thick silane based deposition), the dissolved wafer process, and processes based on SOI (silicon-on-insulator) wafers. Figure 2. Developed at Draper Laboratory, this MEMS accelerometer features a 20 micron thick single-crystal comb structure whose precision and flatness provide high performance while the glass substrate ensures very low stray capacitance. Low stray capacitance is essential to achieving low noise, high sensitivity, and high dynamic range. The structure was fabricated by the dissolved wafer process. The dissolved wafer process  begins with a heavily boron-doped etch-stop layer on a silicon wafer. The desired features (e.g., combs, springs) are etched into the etch-stop layer and then it is anodically bonded to a glass wafer with metal surface electrodes. Finally, the bulk of the wafer is dissolved away, leaving just the boron-doped structures (see Figure 2). High-g Accelerometers. There is a niche market for accelerometers that read out very high g's for crash tests, impacts, and missile and artillery shell launches. Charles Stark Draper Laboratory has produced an accelerometer reading out 100,000 g's. Similar devices will almost certainly be commercialized in time. Angular Accelerometers.MEMS angular accelerometers are used primarily to compensate for angular shock and vibration in disk read/write head assemblies. These devices, while similar to linear accelerometers in terms of design, fabrication, and readout, are designed with zero pendulosity (i.e., the center of gravity is located at the centroid of the support springs), and are compliant to rotational motion yet stiff with respect to linear motion. Delphi and ST Microelectronics, manufacturers of angular accelerometers, use capacizive MEMS sensors and custom CMOS ASICs. Some of the specifications for two angular accelerometers are given in Figure 3. Geophones. Geophones can be thought of as accelerometers with very high sensitivity and no DC output requirement. With no drift or bias stability specifications, geophone design can be optimized to give the lowest noise floor. Applications include seismic sensing, machinery vibration and failure prediction, tracking and identification of vehicles or personnel, and underwater pressure gradient sensing. Conventional geophones incorporate permanent magnets and fine wire coils to measure velocity above their fundamental resonance . This is in contrast to capacitive accelerometers, which measure acceleration below their fundamental resonance. Figure 4. In this cross section of an Applied MEMS device can be seen the wafer-thick proof mass between the upper and lower stationary wafers. A narrow sense gap, large area, low damping, and low resonant frequency all contribute to an extremely low noise floor. There are also piezoelectric and ferroelectric accelerometers. Micromachined sensors can offer size and weight advantages over conventional sensors, as well as a digital output which is easily transmitted noise free. One MEMS geophone that has been commercialized by Applied MEMS Inc. (see Figures 4 and 5) incorporates a three-wafer stack in which the center wafer forms the proof mass. Referring again to Equation 4, the largest mass available in most MEMS devices is the wafer itself, and a vacuum package reduces Brownian noise to a negligible level. The device is read out using a custom CMOS mixed-signal ASIC with a loop operating in force-feedback mode. Figure 5. The upper and lower lids of these Applied MEMS devices have been removed to show the proof mass. These devices are much smaller than the conventional geophones they are replacing. To achieve the maximum sensitivity, the spring constants (and resonant frequency) are reduced so that the maximum acceleration is 0.2 g's over a frequency range of 3–200 Hz. Minimum resolvable acceleration is 30 ng/ Hz for a dynamic range of 115 dB. To avoid saturating the A/D converter, the device must be oriented such that the sensitive axis is horizontal. The noise floor of this device is about 66 times lower than that of most "high-resolution" surface micromachined accelerometers. Many types of MEMS gyroscopes have appeared in the literature, with most falling into the categories of tuning-fork gyros, oscillating wheels, Foucault pendulums, and wine glass resonators. Conventional (non-MEMS) spinning wheel gyros are common, but levitation and rotation of a MEMS device with no springs has not yet been commercialized. Tuning Fork Gyroscopes. Tuning fork gyros contain a pair of masses that are driven to oscillate with equal amplitude but in opposite directions. When rotated, the Coriolis force creates an orthogonal vibration that can be sensed by a variety of mechanisms. The Draper Lab gyro [7-9] shown in Figure 6 uses comb-type structures to drive the tuning fork into resonance. Figure 6. The first working prototype of the Draper Lab comb drive tuning fork gyro is shown here in an SEM image. Due to the superior mechanical properties of single-crrystal silicon, a much better performance was achieved using single-crystal silicon with the dissolved wafer process. Rotation causes the proof masses to vibrate out of plane, and this motion is sensed capacitively with a custom CMOS ASIC. The technology has been licensed to Rockwell, Boeing, Honeywell, and others. The resonant modes of a MEMS inertial sensor are extremely important. In a gyro, there is typically a vibration mode that is driven and a second mode for output sensing. In some cases, the input and output modes are degenerate or nearly so. If the I/O modes are chosen such that they are separated by ~10%, the open-loop sensitivity will be increased due to the resonance effect. It is also critical that no other resonant modes be close to the I/O resonant frequencies. Samsung Corp. has put a large effort into inertial sensors for automotive and consumer electronics applications. Gyroscopic stabilization of camcorders has been shown to improve picture quality, and gyroscopes are enhancing vehicular safety in multiple ways . With gyros costing as little as $10.00 per sensed axis, they should soon claim a sizeable market share. Vibrating-Wheel Gyroscopes. Many reports of vibrating-wheel gyros also have been published . 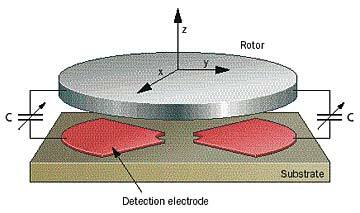 In this type of gyro, the wheel is driven to vibrate about its axis of symmetry, and rotation about either in-plane axis results in the wheel's tilting, a change that can be detected with capacitive electrodes under the wheel (see Figure 7). Figure 7. The vibrating wheel gyro made by Bosch Corp. , with capacitive sensing under the wheel, can be used to detect two in-plane rotational axes. It is possible to sense two axes of rotation with a single vibrating wheel. A surface micromachined polysilicon vibratingwheel gyro (see Figure 8) has been designed at the U.C. Berkeley Sensors and Actuators Center. Figure 8. This polysilicon surface-micromachined vibrating wheel gyro was designed at the Berkeley Sensors and Actuators Center. The potential for combining the mechanical resonator and sense and drive electronics on a single chip permits extreme miniaturization. Figure 9. 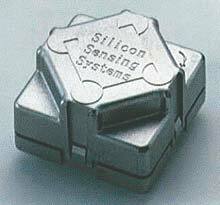 The Silicon Sensing Systems gyro is fabricated from single-crystal silicon with metal added for higher conductivity. This device measures 29 by 29 by 18 mm and is used to stabilize the Segway Human Transporter. indicate the rotation angle. The input and output modes are nominally degenerate, but due to imperfect machining some tuning is required. The output signal is monitored and nulled, yielding a rate gyro. Silicon Sensing Systems, a joint venture between Sumitomo and British Aerospace, has brought to market an electromagnetically driven and sensed MEMS gyro (see Figures 9 and 10). A permanent magnet sits above the MEMS device. Current passing through the conducting legs creates a force that resonates the ring. This Coriolis-induced ring motion is detected by induced voltages as the legs cut the magnetic field. 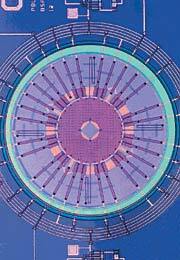 Analog Devices has been working on MEMS gyros for many years, and has patented [12,13] several concepts based on modified tuning forks. Figure 10. The resonant ring at the heart of the Silicon Sensing Systems gyro is shown here as an SEM image. Both electromagnetic drive and sensing are accomplished with a permanent magnet in the center (not shown). The company has recently introduced the ADXRS family of integrated angular rate-sensing gyros, in which the mass is tethered to a polysilicon frame that allows it to resonate in only one direction. Capacitive silicon sensing elements interdigitated with stationary silicon beams attached to the substrate measure the Coriolis-induced displacement of the resonating mass and its frame (see Figure 11). Figure 11. The iMEMS ADXRS angular rate-sensing gyro from Analog Devices integrates an angular rate sensor and signal processing electronics onto a single piece of silicon. Based on the Coriolis effect, its very low noise output makes it a good choice for GPS receivers, where critical location information is required during temporary disruptions of GPS signals. Foucault Pendulum Gyroscopes. 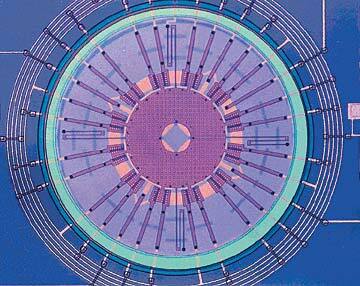 These devices are based on a vibrating rod that is typically oriented out of the plane of the chip [14,15]. They are therefore challenging to build with planar fabrication tools, but recent advances in MEMS technology allow very high aspect ratio MEMS that make it possible to fabricate the pendulum without hand assembly of the rod. MEMS inertial sensing is an established industry, with performance-to-cost rapidly improving each year. Gyroscopes and angular accelerometers are entering the marketplace and will soon make many non-MEMS components obsolete. They should also open up new applications due to their small size and weight, modest power consumption and cost, and high reliability. 1. N. Yazdi, F. Ayazi, and K. Najafi. Aug. 1998. "Micromachined Inertial Sensors," Proc IEEE, Vol. 86, No. 8. 2. T.B. Gabrielson. May 1993. "Mechanical-thermal noise in micromachined acoustic and vibration sensors," IEEE Trans, Electron. Devices, Vol. 40:903-909. 3. J. Bernstein et al. 8 June 1998. "Low Noise MEMS Vibration Sensor for Geophysical Applications," Proc 1998 Solid State Sensor and Actuator Workshop, Hilton Head Island, SC:55-58. Extended version also in IEEE JMEMS Dec. 1999. 4. M. Lutz et al. June 1997. "A precision yaw rate sensor in sillicon micromachining," Tech Dig 9th Intl. Conf Solid State Sensors and Actuators (Transducers '97), Chicago, IL:847-850. 5. Y. Gianchandani and K. Najafi. June 1992. "A bulk silicon dissolved wafer process for microelectromechanical systems," J Microelectromech Syst:77-85. 6. GS-14 geophone. Geospace Inc. 7334 N. Gessner Rd., Houston, TX 77040. 7. J. Bernstein et al. Feb. 1993. 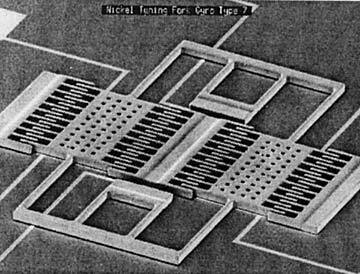 "A micromachined comb-drive tuning fork rate gyroscope," Proc IEEE Micro Electro Mechanical Systems Workshop (MEMS '93), Fort Lauderdale, FL:143-148. 8. J.J. Bernstein and M.S. Weinberg. 5 March 1996. U.S. Patent #5,496,436, "Comb-Drive Micromechanical Tuning Fork Gyro Fabrication Method." #5,349,855, "Comb-Drive Micromechanical Tuning Fork Gyro." 10. C. Song. June 1997. 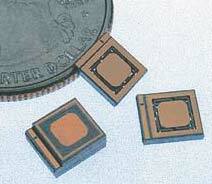 "Commercial vision of silicon based inertial sensors," Tech Dig 9th Intl. Conf Solid State Sensors and Actuators. 11. M.W. Putty. March 1995. "A micromachined vibrating ring gyroscope," Ph.D. dissertation, University of Michigan, Ann Arbor, MI. 12. J. Geen. 3 June 1997. US Patent #5,635,638, "Coupling for multiple masses in a micromachined device." 13. J. Geen. 3 June 1997. U.S. Patent #5,635,640, "Micromachined device with rotationally vibrated masses." 14. J.J. Bernstein. U.S. Patent #5,203,208, "Symmetrical Micromechanical Gyroscope." 15. T.K. Tang et al. 1997. 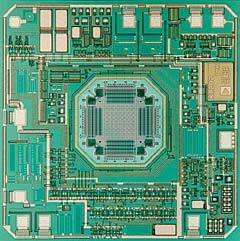 "A packaged silicon MEMS vibratory gyroscope for micro-spacecraft," Proc IEEE Micro Electro Mechanical Systems Workshop (MEMS '97), Japan:500-505.
iMEMS is a registered trademark of Analog Devices, Inc. Thermal fuse RTS now also available with integrated shunt.